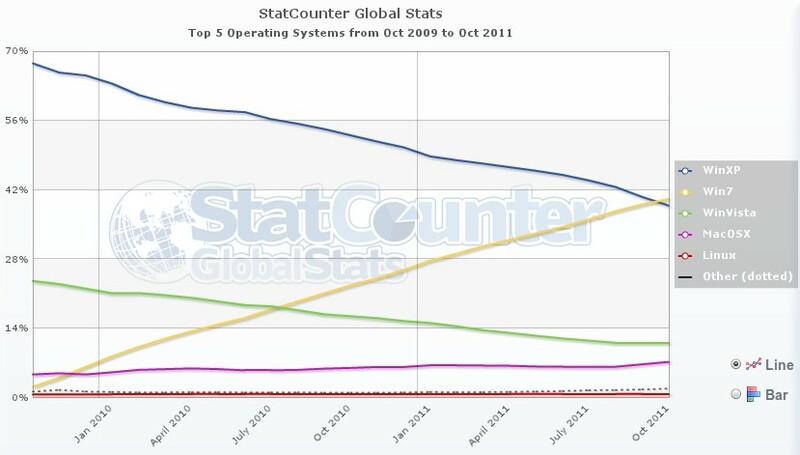 Well, its not official yet, but Microsoft's Windows 7 has now become the most widely used operating system. The user share of Windows 7 just surpassed that of Windows XP recently for the first time since it was first launched in October 2009. This is really a good news for Microsoft as the company has been trying really hard to encourage consumers to switch from Windows XP to Windows 7. Talking about the numbers, Windows 7 now has a strong 40.21% share of all desktop operating systems around the world whereas, the usage share of Windows XP has slipped to 38.64%. All this happened a couple of days back (in October). The rise in usage of Windows 7 and the drop in usage of Windows XP has been consistent since the time Windows 7 was first launched. Checkout this graph below which compares market shares of all operating systems. Last year in August, we had told you that Windows XP Service Pack 3 had a strong market share of 53% and within one year Windows 7 has removed it from the top position. Windows Vista was kind of a disaster for Microsoft as many users straight away downgraded to Windows XP after using Vista for the first time and in fact even I was one of them. But with Windows 7, Microsoft has won back all its disappointed users who gradually started making the switch from Windows XP to Windows 7.